Well it's been a good snowy morning here in the Piedmont of North Carolina. We only got about 1 inch of snow and it melted pretty quickly but my kids still enjoyed eating ice off the sidewalk. 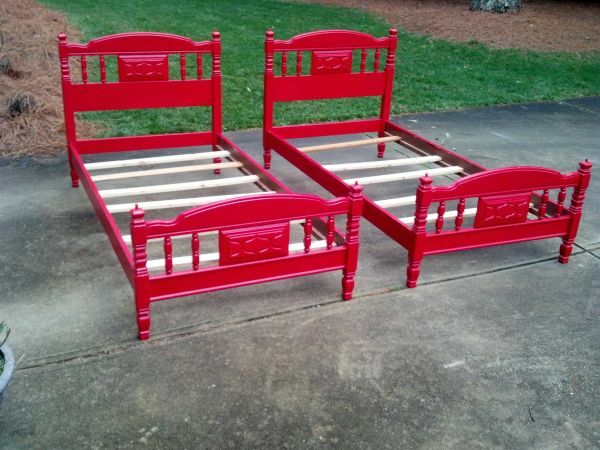 This morning my craigslist dreams came true when I happened upon these Red Twin beds for the boys. 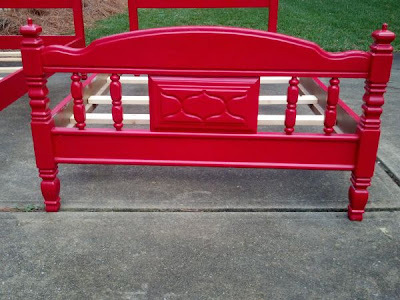 Aren't they so stinkin' cute with their shiny red paint and those curved details? At $120 for both it was quite the find. I emailed the person selling them yesterday and held my breath all day for a return email. Finally last night at 10 PM the seller said the person that was going to buy them was a no show, possibly due to the rain. But their no show was my gain. This morning my wonderful husband drove 30 minutes to pick them up and lucky for us they were dismantled and ready to go. I was worried about them being vintage and possible screw strippage (I know that's not a word, but you know when a screw gets stripped?) But we were in luck because these are seriously well built and the side rails actually slip into grooves built into the headboard and footboard. They are solid wood and well made. Score. Any person that looks at patterns and design influences will notice this pattern inside that rectangle. Doesn't it totally remind you of a Moroccan trellis design? It turns out though that these are at least 40 year old beds. The guy who sold them to us bought them for his beach house, but didn't want to use them because there is no guard rail when they are used as bunk beds. The guy who he bought them from had them as a child and he was at least 40 years old. 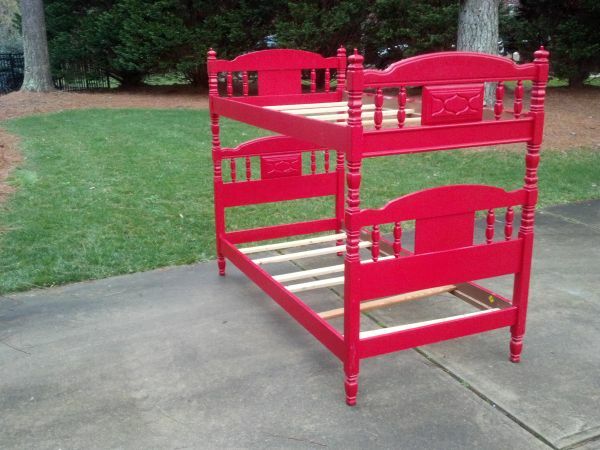 Just an FYI we won't be using them as bunk beds either for the time being since our kids are still small. I could not be more happy with these beds. They were just what I was looking for -vintage matching beds for the boys at a good price point and built to last. Can't wait to get them set up. But it might be a few weeks because we'd like to replace the boy's flooring first, get their current beds sold, etc. But I will show you pics as soon and they are ready. p.s. quick kitchen update. The subfloor is installed. The kitchen cabinets were put back into place. The countertops were put back only to realize they were cracked and warped from sitting outside in the rain. Whoops mistake on the guys who put them out there. So today someone will come out and measure them and order us new countertops. We will be getting the same kind. Today our lower cabinets are being painted back to white, but I've asked to keep the insides gray because it will be kinda cool looking when you open them. I think I'm going to do the same thing to the upper cabinets too. Also, not sure about any wall openings. The quote we got was much too high, so we'll see.